Two locations connected by water! we provide to paddlers interested in longer river trips. Recent College graduates on a river trip. The easy way to do river trips. Bring your own boat, rent, or a combination. Park at our shop and jump in the kayak truck. C&K will load up the gear and unload to launch you with a smile. The Portlandville Paddle Sports Store is the perfect ending spot, not only is your car already there waiting for you but we will greet you with a smile upon arrival and take care of all equiment. Drinks and snacks are available at the shop to quench your thirst after your paddle. Crumhorn DEC car top boat launch is recently developed to aid in kayak launch. Enter the Susquehanna river with ease and its just a quick trip to our shop. This is a great trip with kids in tow. Milford bridge is an easy launch point, our most reasonable trip for intermediate to beginner paddlers. 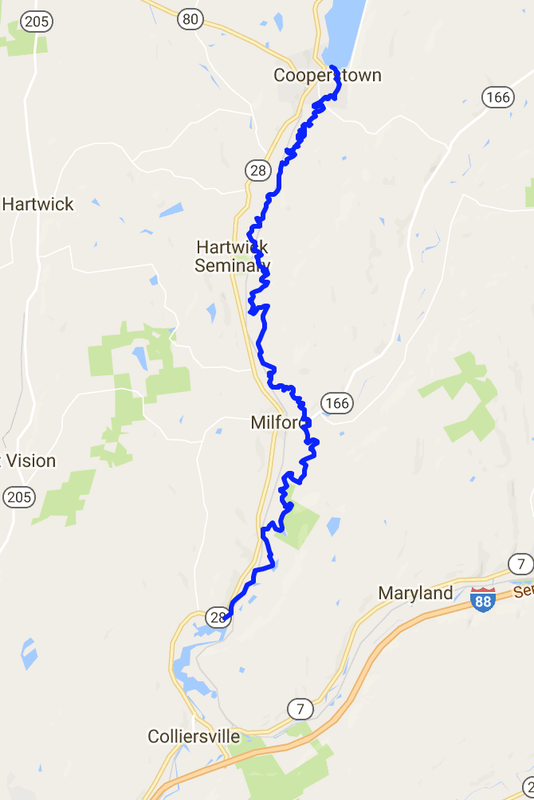 From milford bridge to our shop in Portlandville is only 7.7 miles, slow moving water. Winding through the trees and natural landscape, look out for bald eagles fishing the river and deer on the shoreline. Compton Bridge, locally know as 11c, where Oak Creek merges into the Susquehanna River. The water is moving upon entry and slows soon after. If you aren't up for the trip all the way from Cooperstown this is a great option. We recommend more experienced paddlers for this trip. A decent length clocking in at 15 miles, 5 -6 hours so make sure to pack water and snacks. This is our longest available river trip. You can start at our location in Cooperstown at Brookwood Point, paddle through Otsego Lake into the head of the historic Susquehanna River all the way to our Portlandville location. We recommend this trip for the more experienced paddler, it is an all day trip with some moving water and switchback turns. Pack a lunch and spend the day on the river! Enjoying a weekly summer rental? We deliver to your waterfront lodging! The Kayak truck en route to Delivery. Canoe & Kayak will deliver for a minimun of a full day rental. Car top kits available for offsite rentals. Basic instruction provided on securing a kayak to your vehicle.